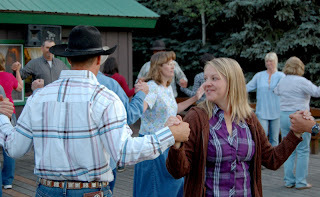 I can not believe I almost forgot to post about square dancing! 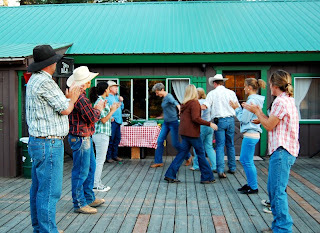 While at Elk Mountain Ranch we had a wonderful evening dancing out on the deck and then listening so come really great country music. 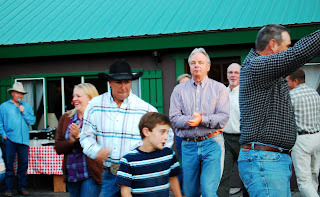 Some of the guests were a little apprehensive about square dancing. I couldn't have anyone sitting on the side lines. 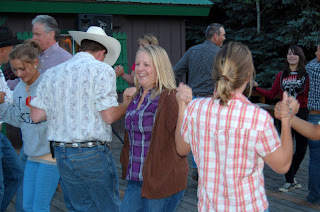 I LOVE line dancing and square dancing is a total blast too!! Caleb and I did our best at getting everyone up and dancing. I think we got just about everyone up. And you know what? Everyone had fun!! 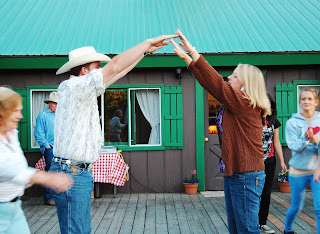 We did a square dance that reminded me of some of the dances in Jane Austin books!! It was a lot of fun. We stood in two lines and then did a star thing at one end. It was fun. Then the couple at the front of the line would take hands and then run down the middle. Yeah, Caleb is super fast and I about peed my pants from laughing so hard. I have never seen any one move that fast!! I had a hard time keeping up. It was more like he flew and drug me along!! We then made this arch and everyone walked through and we started all over again! Mr. 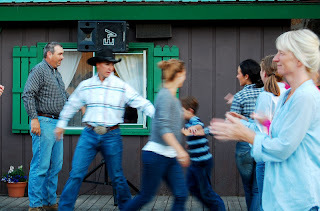 Cowboy also takes his dancing pretty seriously. He actually is pretty darn good. He can do circles around me on the dance floor. He is one awesome jitter bug dancer. We were having a really fun evening. The caller, Randy, was really good at teaching us our moves!! 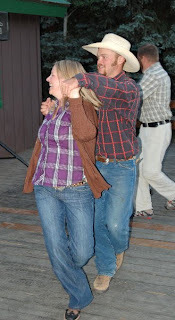 We then tried a new dance that he has never done at Elk Mountain before. It was a bit complicated at first but then we got the hang of it. 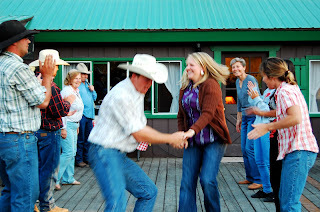 Randy and his wife went in the middle of the circle to how us how we were supposed to do the dance. We switched partners a lot. Every picture I have with Caleb my eyes are closed. And notice we are so not doing what everyone else is doing? Yeah, I was having a hard time catching on! It did take the entire group a little while to get it. We had to do turns and walk backwards and turn and twist and change partners!! I do have to admit that I only ran into Caleb's back one time. I went forwards while he was going backwards and we kinda hit. It was really a wonderful night. 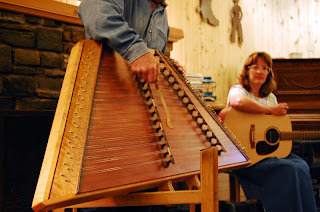 After dancing we all gathered together in the lodge to listen to Randy and his wife play some music. 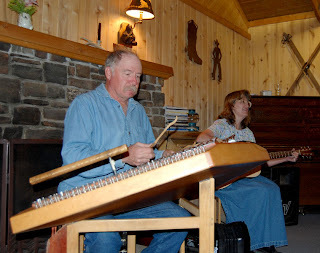 Randy plays the Hammered Dulcimer. Randy handmade his! And let me tell you he was really good! He has won some championships too. It's a really neat instrument. 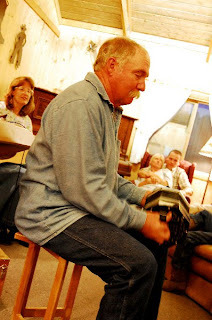 Randy also played the wooden spoons and an accordion type instrument. It's not an accordion, but it's like one. It looks easier to play than an accordion. He is very talented. 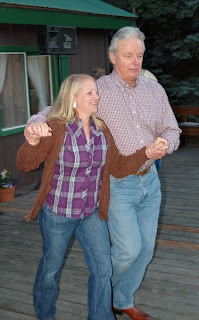 Randy told me that he majored in music and his father was a square dancing caller and he learned it from him. Randy also has two mustangs that he is training. He was a very interesting man. I would have loved to have seen him work with his mustangs. 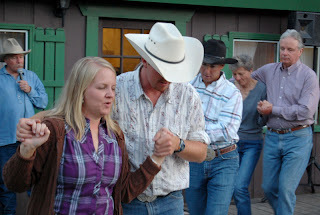 All this square dancing went on Tuesday night. Then on Wednesday we went white water rafting. I am only a bit mixed up in my daily activities. But then again, if I hadn't remembered I couldn't had posted this fabulous picture of Mr. Cowboy and myself. Yes we so very GORGEOUS!!! Haa haa haa haa!! And yes, Mr. 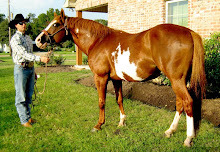 Cowboy does realize he has a horrific farmer's tan!! I love it. I teased him all day about forgetting to take his shirt off. I am such a sweet wife. The land behind us is where Randy keeps his mustangs. 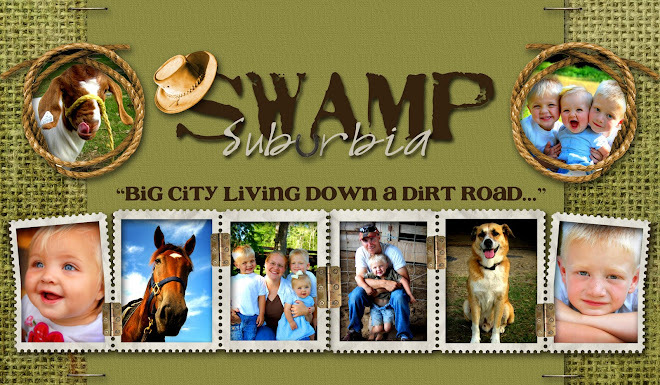 I think I could live there, in the summer time at least. Today was Big Cowpoke's first day of school. We were rushed out the door so I will have to take pictures tomorrow. I am never on time for any thing. OMG HOW MUCH FUN!!! You were a little over an hour from me!!! I just had to drive North up 17 and cross over Poncha Pass!!! 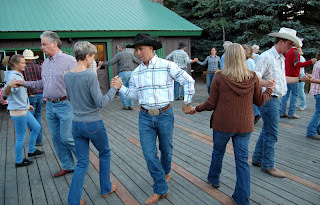 I'm bummed...but I think it's a good reason for you to come back so we can all square dance with you guys at that ranch!!! 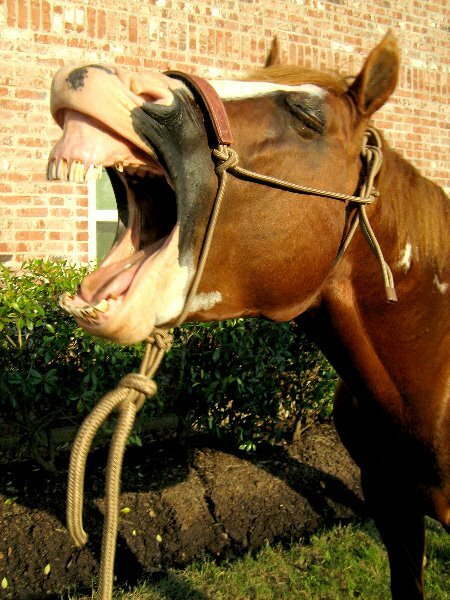 Then you can come down and see my ponies!!! 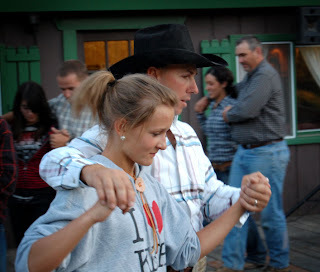 I remember square dancing in middle school. It was fun. I would love to do it again sometime. Cute photos. Wow- school starts SO early here in the south. Did it start that early for you up North?? How fun is that! I love dancing! 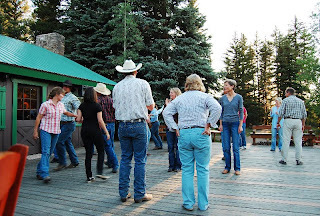 Two-steppin', square dancin', line dancin', you name it. Looks like you had a fantastic time! I would have loved to be there with ya!! Well, I guess Paula at the Broken Y is also teamroper. How that happened, I don't know! 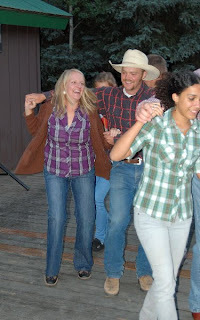 The square dancing looked like so much fun!! 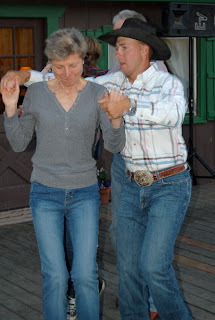 I have never done that before, I am not a good dancer, and my other half is a really bad dancer! He has NO skills! LOL!! I wince every time my OH takes off his shirt, he also has the farmers tan! It is so awful!! You guys look like you're having the time of your life! What a blast! Looks like fun! You'all are like the youngest group of square dancers I've ever seen. jk I loved it in school. 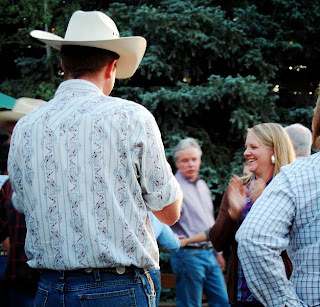 It's so much fun seeing you and Mr Cowboy in your "natural environment"! You guys look like you had TONS of fun! I wanna learn how to swing dance! Ooo fun! 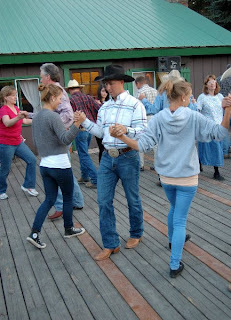 I haven't square danced in so long! I know I would never have been able to catch on to all those moves. Love the farmer tan picture. I think you both look great--together and happy! Looks like you all had such a blast! 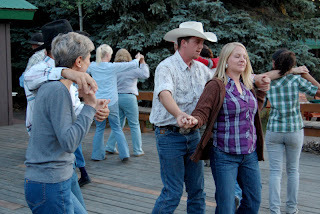 I'm not very good at square dancing and get all garbled and confused...which is probably just fine since I don't think I'll ever be able to dance again in the same way that I used to be able to. My knee is too wonky and awkward and I often feel like it's going to give out on me. bah! 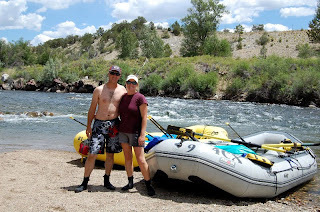 That photo in fron to fthe river rafts...too funny! You guys are adorable!